This Sunday Feb 7, you can see owls right here in the San Fernando Valley and they are indeed superb. 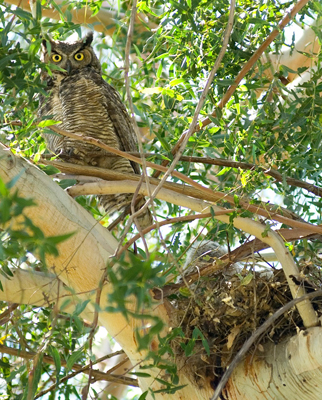 For several years, a pair of Great Horned Owls have nested in the Sepulveda Basin Wildlife Reserve during the winter-spring months. The pair was spotted and logged to eBird just a few days ago. 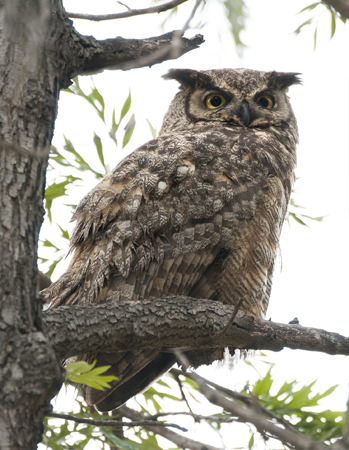 Join us for our regular first Sunday of the month birdwalk at the Sepulveda Basin and make it a Superb Owl Sunday. If you want some Superb Owl excitement before the big day, check out the Burrowing Owls that make their home in San Jose, not far from Levi Stadium. Or you can watch live streaming web cams of a nesting Great Horned Owl Pair or Barn Owls. Photos of Great Horned Owls at Sepulveda Basin Wildlife Reserve by Scott Logan of Wild Wings Backyard Nature Store. The walk starts at 8:00 am Sunday Feb 7. Directions here.